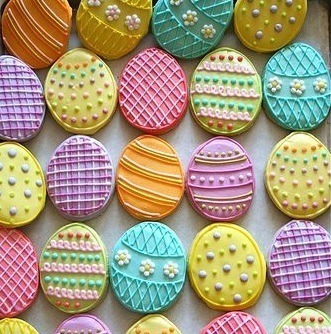 Easter, oh Easter. You might be not so (if not at all) religious and you are not lenting, and you might not be decorating eggs with your niece, but still Easter sounds good, doesn’t it? It’s the glorious smell of spring, supermarket shelves filled with our favourite chocolates encased in oval-shape packaging, and long awaited bank holiday. There are staple foods and dishes for Easter such as roasted leg of lamb with mint sauce, roast pork with crackling and side of spring vegetables, hot cross buns, the Simnel cake, chocolate, chocolate and more chocolate. But this Easter, to celebrate Spring and make it more colourful, filled with the goodness of eggs to the max, we put a spotlight on egg dishes and dare to suggest you the alternatives to the classics! So we say, when the life gives you eggs, eat a wonderful meal out of it! The king of egg dish! 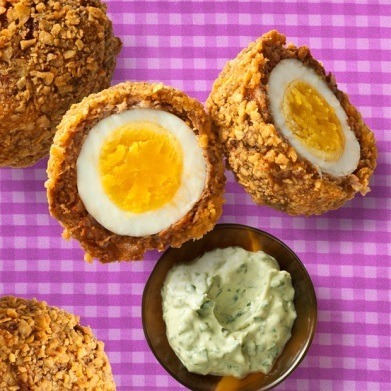 It is Scotch eggs. It might be easily dismissed as a pub grab, but when it’s done right, it is seriously good. Hard-boiled eggs (but hopefully slightly runny inside) are wrapped up in quality sausage meat with good seasonings, coated with crisp golden breadcrumbs. When it is so crispy, soft and juicy, it would rock your world! It is a rather ignored classic food item and it’s about time it gets the credit it deserves! The origin of the pizza is still uncertain but that doesn’t matter because this one tastes so damn good! 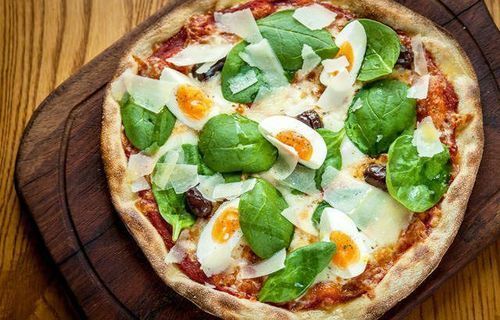 It’s a simple pizza base topped with tomato sauce, mozzarella, parmesan cheese, spinach leaves and slices of soft-boiled eggs. The flavour combination of fresh spinach and creamy eggs is a match made in heaven. Bright green, yellow and white, it is a pizza dressed in a spring jacket. When we think about Portuguese food, we think of peri peri chicken but hold on! 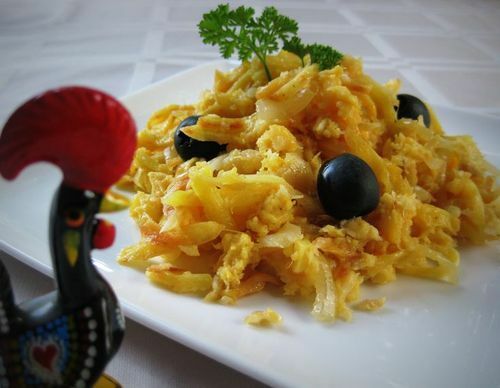 Portuguese staple dish often contains, salted cod, Bacalhau. Bacalhau à brás is best described as scrambled fish and chips (what not to like, right?)! It is a dish made with scrambled eggs, mixed in with salted cod, match stick potatoes and caramelized onions. Sometimes black olives are used to add an extra depth to the dish. It is more substantial than our regular omelette, and more elegantly Mediterranean yet humble. It is an easy introduction to Portuguese cuisine and a pretty tasty one. Officially the most popular cuisine type in the nation, this Chinese dish should definitely hit the spot and should be included in your Easter lunch option. Foo young dish is a Chinese style omelette (often considered as a popular street food) mixed with vegetables such as spring onions, beans sprouts, bamboo shoots, cabbage, and whatever proteins you like such as minced ham, pork, beef, chicken or prawns. Often served with sweet and sour, or soy-based gravy on a bed of white rice, it would make a perfect Easter lunch or dinner. 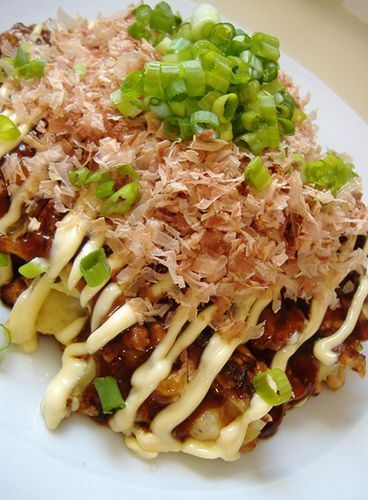 Speaking of Oriental style egg omelette dish, we can’t forget Japanese style egg pancake, Okonomiyaki. It consists of eggs, flour, cabbage, and pork or prawns. This eggy pancake is pan-fried and topped with sweet Japanese style thick Worcestershire sauce, dried fish flakes, dried seaweed and mayonnaise. Crispy on the outside, gorgeously soft and creamy on the inside, packed full of vegetables and the goodness of pork, it is one wholesome tasty dish to die for! It might not be an egg dish as such. But eggs make the whole difference to this dish. It is a bowl of white rice topped with sautéed julienne vegetables, spicy sweet Korean chilli paste, thinly sliced beef and a raw (or fried) egg. It is Korea’s signature dish filled with an exciting yet balanced combination of flavours. Typically used vegetables are courgette, cucumber, mushrooms, radish, and bean sprouts. Egg yolk enriches the flavour of the whole dish and brings it all together. It is seriously an awesome dish. 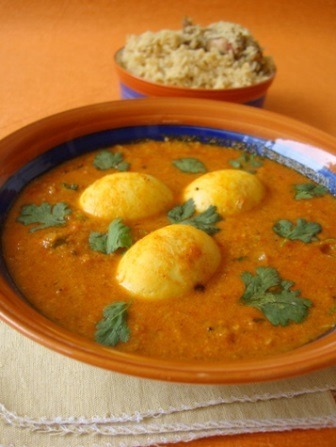 Egg curry might be different from what we are used to as curry. Hard-boiled whole eggs are added to spicy and tangy tomato-based gravy, and sometimes coconut milk is added to be made creamy. Eggs add richness and mildness to spicy curry. Vegetarian, nutritious and gorgeously spicy, it is a very satisfying curry that you will love! Spice up your Easter egg this year. Eggs in curry; unfamiliar concept, beautiful result. 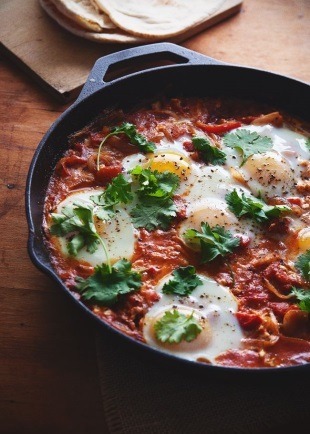 Another beautiful concussion of eggs and spices we suggest is Shakshuka. This North African, Tunisian dish consists of poached eggs in tomato sauce spiced with chilli and cumin. There are some variations to the dish depending on the regions, and potatoes, beans and other types of seasonal vegetables, cheese or spicy sausages can be added. Served with bread, dip into the mixture of spicy sauce with oozing egg yolks. You will scrape the last drop of the sauce off the plate for sure. So this was a list of just a few wonderful egg dishes (eggs for dinner) that could transform your Easter lunch table. There are of course a lot more; Quiche, Frittata, Tortilla, Huevos rancheros, Eggs benedict, Deviled eggs, the list will go on forever. It is because egg is one powerful player that is so versatile and works so well with almost any ingredients and in any way of cooking. The flavour of eggs is so creamy and almost cheese-like, it never gets overpowered by other ingredients either. Anyways, whether you are going for something deliciously traditional or something exquisitely different, bring life to your eggs and have fun with them. Spring has come!